I finally got Virtual On Oratorio Tangram up and running on my USA OMG Twin unit. Looking through the service options i noticed that it supports the "billboard" win counter on Versus City and Blast City cabinets... 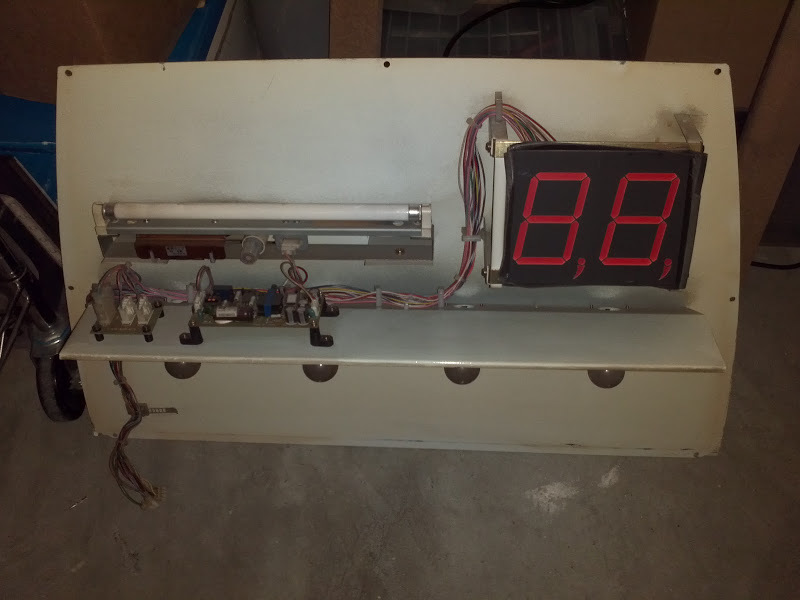 I'd be interested in maybe building my own bilboard/win counter into my Twin unit setup but I'm finding it extremely difficult to find information about this.. 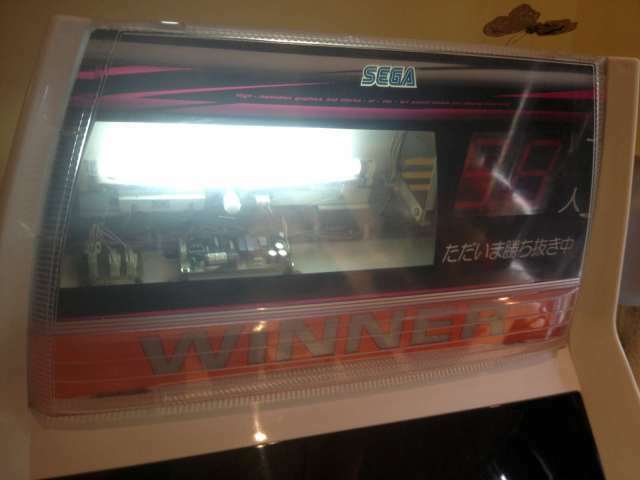 If you're unfamiliar this is what they look like, there's a "Winner" lamp as well as a 2-digit counter to show how may wins the player has. 1 is just a digital output pin for the winner lamp (controlled just like the start lamp on most games). The other 8-pins on a Model 3 board (according to the VF3 manual) connect to the configurable digital I/O pins (1-4) on connectors CN1 and CN11. I believe these work like a parallel port and can be used input or output. Supposedly these win counters are supported in some ST-V and NAOMI games, I'm unsure how they connect to those systems. When activated in VOOT it tries "communicating" with the billboard. I'm not entirely sure what it needs to receive back from it. If anyone has a picture of a 837-11854 board or knows of an alternate board number used on the New Versus or the Blast please let me know. ideally I'd like to source one of these board and hook it up to my own display, or figure out the protocol and use an Arduino to build something that can communicate in place of a board. The post was edited 2 times, last by twistedsymphony ( Jun 9th 2016, 1:45pm ). according to that on page 5 when JP1 is set to position B the kick-harness connector is used for billboard output instead. this shows the 7-segment board as being PN 837-12792-02 which is different than the board used in the VS City cabs. it also clearly shows 1 bit for the winner lamp and then 8-bits for the 7-segment data. All of the documentation I've read points to this being output only, which makes sense. perhaps the model 3's "communicating" message simply means that it's going through some kind of blind startup output signal. I'd be open to advice on the best way to sniff the data coming out of those pins, though without knowing the actual protocol or what the display output is supposed to look like it might be difficult to decipher. The post was edited 2 times, last by twistedsymphony ( May 2nd 2016, 7:49pm ). from this thread on Arcade Otaku: forum.arcadeotaku.com/viewtopi…hilit=Versus+City#p404860 So far that's the biggest source of info I've found. 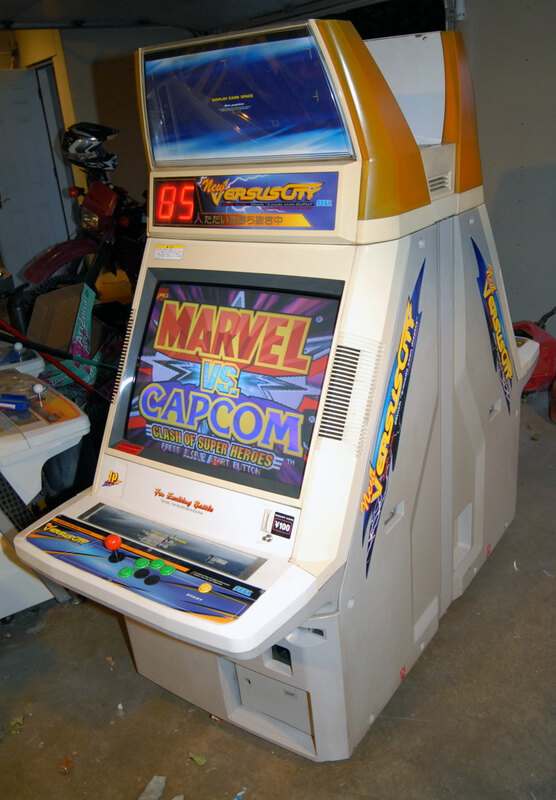 I've seen a lot of pictures of these cabs with SFII and SFIII and rumors of SFII supporting the billboard as well as Capcom having worked with Sega to deliver games in the VS city cabs though I've yet to see any photos of these games with anything being displayed in the billboard other than the generic attract messages. Honestly, it's Highly unlikely that SF2 supports the billboard, the earliest cab with a billboard was the Versus City which was released in 1996, which was half-way through the CPS2's life, not to mention there is no information anywhere that indicates the CPS2 supports outputs of any kind... either the games in these pictures are somehow modified to support this or the picture timing is just such that the billboard attract mode makes it look like the game is displaying wins, even though it's not. The post was edited 17 times, last by twistedsymphony: Updated Supported Games List ( May 19th 2016, 2:41am ). My latest idea of capturing data is to use a 8-bit parallel to serial converter like this: sparkfun.com/products/retired/9519 and then I could use the same serial to USB and recording setup that @winteriscoming used when sniffing the card reader data. I don't know why I didn't think of this sooner, I think I even have a few of those shift-register ICs kicking around from older projects. for reference the test pattern looks like this with about 1 second between each display change and repeats until the option to "clear check" is selected in the service menu. The rate of flashing of the winner lamp is 2 to 3 times per number change, it's definitely flashing at a different rate then the number changes; going frame by frame in the video you can see this very clearly. Also going frame by frame the first digit always changes about a frame ahead of the second digit, which speaks to this being a very low speed system and likely one that is sending the display change information one 7-segment at a time. I've also received my Sega JVS 2 JAMMA I/O board so now I need to see if I can read the output and make any sense of it. The post was edited 4 times, last by twistedsymphony ( May 12th 2016, 4:05pm ). Pure Speculation on my part but my original thought process was that with 8 bits the first bit could select the first or second 7-segment display and the the last 7 bits could determine which segments light up. I dismissed this idea since the displays have 9 segments each (because of the period and comma). I had sent a message to SalorSat asking if she had any experience with the billboard data since she's done a lot of work with Model 2 boards. and while she wasn't familiar with the billboard output she had the same innitial theory about the 1 selector bit plus 7 data bit setup. Thinking about this more I've never seen any pictures or video of the period or comma segments lit up, so it may be that they're off-the shelf displays and those segments simply aren't used. Looking at the video majors sent me and having seen the system menu options for the billboard in virtual on it seems as though there is support for at least 2 billboard outputs on the same PCB... this would make sense since many of these VS cab games are designed to share 1 PCB across two cabinets, splitting the video and sound output and routing the controls across to the other cab. if they were going to display different win counts on the different billboards then they would have to support more than one. BUT this may still work with the selector setup. Considering the model 2/3/genesis/saturn call came out around the same time and were likely developed by the same hardware engineers it seem likely that they might have used a similar protocol. The fact that the first 7-segment visibly updates before the second also leads credence to the selector bits/data bits theory. The post was edited 1 time, last by twistedsymphony ( May 12th 2016, 4:06pm ). So last night I hooked up my Sega JVS to JAMMA I/O and ran Virtua Tennis 2. I have a DSO Nano Oscilloscope so I went around probing the output pins and while I didn't get too much concrete information I did learn a few things. The pin out is attached below (pay attension to the pin numbering, it's numbered as if the JAMMA connector is pointing AWAY from you which is counter intuitive IMO). I should note that I'm using a Rev B JVS to JAMMA I/O, everywhere else I've read about this has stated that only the Rev A supports output, but that's BS because I'm definitely getting data out when I activate the billboard test. In any case the output test allows me to output to "1P side" or "2P side" leading to the idea that a single PCB can support two separate billboards. I discovered that output pin 6 is low 100% of the time when outputting to 1P side and has some activity but stays high about 80% of the time when outputting to 2P side. This leads a lot of credence to the selector/data pins theory. pin 7 or pin 1 MAY be the digit selector the activity on those pins is fairly uniform and predicable, though it doesn't seem to change states as quickly as one might assume is necessary to select the digit. Activity on all of the pins is really slow. they switch between high and low and you can usually count in seconds the amount of time before they change states. so I believe the pins only output data when they need to change the state of the display. At this point I've got output working and confirmed it's slow enough to read with a Arduino so the next step is building something that can dump these outputs into something I see so I can try to make sense all the pins within the context of each other (since my scope only has 1 channel). Sounds like progress! I'd say once you figure out the protocol, you could do a couple different things. 1. Interpret the data on RPi and display on an larger LCD marquee with graphics that match the game you booted. 2. Interpret the data on RPi to drive a small LCD (think 3" cheapo LCDs) that gets mounted and just displays the numbers. 2. Use off the shelf 7-segment LEDs and rebuild something that works like the stock ones. RPi is overkill, this can be done (and is better suited for) something like an Arduino. As a matter of fact, if the protocol ends up being what I think it is you could do this whole thing with logic gates and flip-flops... but it's still way easier to just program an Arduino or other mcu. As for the displays. I found some 5" tall 7-segments on eBay $34 for a set of 4 and run on 12V DC... which is perfect for this application. (for reference the original Sega displays are only 3" tall and run off a high voltage CCFL setup). I have an idea in my head for an end-game setup for virtual on that involves a large 16:9 LCD, some web cams and a PC emulating supermodel but I don't want to get ahead of myself. I'd love to have a couple of billboards like that, working with MvC2! It would be awesome for 1v1 matches!! is there still interest to this ? I can take logs from NAOMI Virtua Tennis 2 tesmode, if anyone wish to try figureout bits functions. Thank you! this is extremely helpful. based on what you posted and what I'm seeing from the outputs I can confirm that the left most bit is pin 0 and the right most is pin 7. Also the pins output is +5V for a binary 0 and ground for a binary 1. I also have a very long list of games that DO NOT support the billboard. The post was edited 1 time, last by twistedsymphony ( May 16th 2016, 2:07pm ). 19 -> P2 Digit 1 "7"
39 -> P2 Digit 1 "3"
59 -> P2 Digit 1 "5"
69 -> P2 Digit 1 "9"
79 -> P2 Digit 1 "1"
99 -> P2 Digit 1 "6"
B9 -> P2 Digit 1 "2"
D9 -> P2 Digit 1 "4"
E9 -> P2 Digit 1 "8"
F9 -> P2 Digit 1 "0"
1B -> P1 Digit 1 "7"
3B -> P1 Digit 1 "3"
5B -> P1 Digit 1 "5"
6B -> P1 Digit 1 "9"
7B -> P1 Digit 1 "1"
9B -> P1 Digit 1 "6"
BB -> P1 Digit 1 "2"
DB -> P1 Digit 1 "4"
EB -> P1 Digit 1 "8"
FB -> P1 Digit 1 "0"
1D -> P2 Digit 2 "7"
3D -> P2 Digit 2 "3"
5D -> P2 Digit 2 "5"
6D -> P2 Digit 2 "9"
7D -> P2 Digit 2 "1"
9D -> P2 Digit 2 "6"
AD -> P2 Digit 2 "A"
BD -> P2 Digit 2 "2"
DD -> P2 Digit 2 "4"
ED -> P2 Digit 2 "8"
FD -> P2 Digit 2 "0"
1F -> P1 Digit 2 "7"
3F -> P1 Digit 2 "3"
5F -> P1 Digit 2 "5"
6F -> P1 Digit 2 "9"
7F -> P1 Digit 2 "1"
9F -> P1 Digit 2 "6"
AF -> P1 Digit 2 "A"
BF -> P1 Digit 2 "2"
DF -> P1 Digit 2 "4"
EF -> P1 Digit 2 "8"
FF -> P1 Digit 2 "0"
this is good in that we've figured out the basic command structure. however this is bad in that we likely wont be able to extrapolate many more commands without capturing similar examples or access to the hardware where we can issue every possible command and see the output. The post was edited 2 times, last by twistedsymphony ( May 25th 2016, 1:32pm ). there doesn't seem to be a discernible pattern from which we could extrapolate additional letters, but maybe there would be if we inverted or reversed the binary string? I haven't got that far yet. we could potentially extrapolate up the alphabet but it's still impossible to say if that's correct without being able to test on a real billboard PCB. the problem is that there is not enough space within 5-bits to extrapolate the entire alphabet... following the pattern of 0-A you'd get up to V which would occupy the same code as blank. this means that either not all letters are supported or the method for displaying them doesn't follow the above pattern. If i had access to a real PCB I would simply run through all 256 potential output combinations and saw what came out the other side. The post was edited 4 times, last by twistedsymphony ( May 17th 2016, 2:10pm ). 2 player, 2 lamp state (off and flashing), and 4 digit select of numbers. 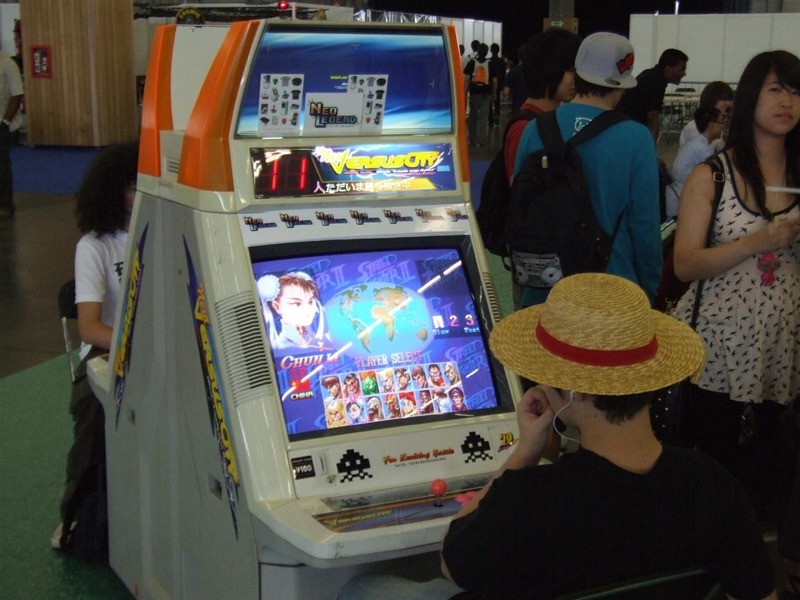 2 player means it must be using 1 bit. 2 lamp state must use 1 bit too. so the rest is 4 bit for numbers and special chars. We're already WAY past that. go re-read post #14, #16 and #17 above. Anyone out there with an ST-V Multi board want to see if you can find games that support the billboard? I'm going to start building hardware that can output the commands that we've found so far but in the mean time it'd be handy to try and build a comprehensive list of games that support Vs billboard output. So far only Sega games have been confirmed to support it and Virtua Fighter 3 is one of them. I'd think VF Remix or VF Kids would be the most likely candidate on ST-V. Supposedly CN32 is used for billboard output, but this is a dual use input and output port so some jumper changes might be necessary to get outputs on it. Regardless of the jumpers you should be able to check just looking at the system menu. if there is an output test/clear option that's a good indication. Some games I've found require that you turn on billboard output in the test menu before the output test option appears. I even found that there is 1 Tri-Force games (Virtua Striker 2002) that supports billboard output. If someone with an ST-V multi wants to check and confirm (procedure below) that would be awesome. I'd like to check Virtual-On Force (Hikaru), and Gundam Battle Operating Simulator (Chihiro). Those are the only two games on those systems that i think could potentially have support. I'm fairly certain that anything LCD based wont have billboard support. If you want to check a game yourself.. go into game test mode and look at for an "outputs" menu option. If the billboard is supported most of the time you'll see "check" and "clear" options available inside the outputs menu. Sometimes the output will just go through an automated test if so the billboard test for "winner lamp" and "7-seg". Sometimes the outputs menu option or the billboard tests wont be available until you enable the "billboard" option in game assignments. If a game supports the billboard you should see a brief flurry of activity on the output pins when the game first finishes booting (usually right after the export warning) this is the billboard "clear" routine. Since the billboard output pins just hold the last command state until something changes it will typically end with pins 4 and 5, or pins 4, 5 and 6 set low, which is the final clear command (it varies from game to game). The post was edited 1 time, last by twistedsymphony ( May 20th 2016, 12:18pm ).